When I started this writing caper I decided to review everything I read. I posted those reviews to Amazon in the UK and US (you could in those days without having to spend $50 with them first! #JustSaying!) and Goodreads. It didn’t cross my mind to post them on my blog… duh! As I’m aiming to stick to a blogging schedule – oh, how we laughed! – and as I read desperately slowly I shall add in these retro-fitted book reviews when I don’t have a current one to post. 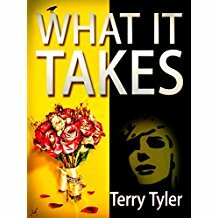 Highly enjoyable though heartbreaking at times the realistic storyline in What it Takes has enough twists and turns in it to hold your interest. It also keeps you guessing as I couldn’t be sure where the story was going to go next and it had a satisfying ending – what more could you want. I loved the way the story was written from the point of view of several well developed characters and in fact everything about Tyler’s style of writing. I’m already looking forward to reading more of her work and would recommend this book to all who like to read something unpredictable.